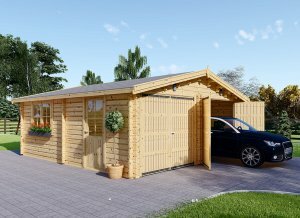 A lovely wooden garage that will fit in beautifully with the natural environment; the Low Barn wooden garage is truly a triumph. Created in traditional barn style, it impresses at first glance. It will also provide plenty of space for all your needs. Whether you would like car storage and a workshop, or external storage with utility space and a playroom, there will be ample room to meet all your needs. The design of the 16 x 20 Low Barn wooden garage is truly lovely, yet it is the features and superior construction that shines through. 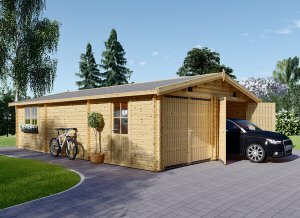 Made of slow grown conifer timber, its reinforced roof construction ensures you have a solid, safe wooden garage. This is thanks to the thick roof joists that strengthen and protect the structure. The cleverly incorporated tongue and groove interlocking corners ensures stability of the entire structure. The barn-style roof and doors are simple, yet attractive. Personalize it with an added roll-up garage door for an extra cost.